Quality VoIP call quality when used with SIP (session intiation protocol) supporting VoIP softswitches or IP Pbx . SipCo SoftPhone or mobile dialer is a SIP client application which allow user to login to IPPBX or Softswitch and make Voice and Video calls over the network . SipCo SoftPhone or SipCo Mobile Dialer is a SIP client for iOS and Android . SipCo mobile dialer provides High Quality VoIP call for mobile devices when used with SIP (session initiation protocol) supporting VoIP soft switches or IP Pbx. It can be used conveniently on various mobile platforms such as Android and Iphone. 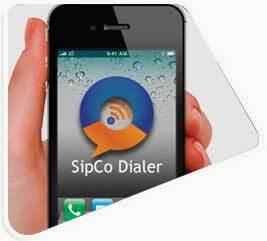 SipCo mobile dialer is also available for Windows Desktop. SipCo SoftPhone is the best SIP Client for high quality audio and video calls as well as text messages. Softphone has various features like call transfer, conference call option and auto login with QRcode/Bar code and many more.